Foxy Bingo are bringing you the chance to win free tickets for their guaranteed £10,000 Friday night jackpot game this week, which means someone could win this massive prize pot effectively for free. Now wouldn’t that be something! Have you tried out the fun sugar train slot on Foxy Bingo yet? Well if not now could be the time to do just that because it is spinning the reels of the sugar train which could get your free cards into their Friday night jackpot game. Each time you take the sugar train for a spin 10 times between now and Wednesday this week, it will get you 1 free ticket for the £10k guaranteed jackpot game – it is as simple as that. The sugar train slot is a sweet delight, which takes you back in time to your favourite sweet shop days. The game itself has 5 reels, 25 pay lines and some real fun bonus rounds. It is also very easy to play, you simply need to select your stake (which can be anything between 25p and £12.50) select your pay lines and hit the spin button. 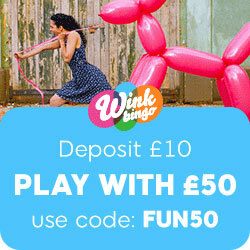 You do still have the option of logging onto Foxy Bingo and purchasing tickets for the big £10k jackpot game, these can be pre-bought as from now at a cost of £1 each – or play the sugar train slot and try to win some for free (where you could also win big). Two for the price of one, sounds good to us! The winter issue of the Foxy Friend mag and calendar is out now and it is just packed full of great offers and competition, plus there is an exclusive interview with Westlife in the magazine, which is well worth a read off. If the Foxy mag has already dropped through your letter box, don’t throw it in the bin as you really could miss out. This entry was posted in Bingo Blog and tagged Foxy Bingo on November 22, 2011 by Emma. The weather has now definitely taken a turn for the worse outside, but not to worry as Foxy Bingo have got some great winter bingo warmers going on to keep you entertained whilst you are snug and cosy inside your homes. An exciting every ones a winner promotion will be coming out to play on Foxy Bingo between 21st and 25th November. As the name of this one pretty much suggests, take part in this promo and you are guaranteed to win a prize. Up for grabs every day is a top prize of £100 and you are guaranteed to win something, so if you are a registered funded Foxy player make sure you take part in (everyone’s a winner) as you have got nothing to lose, only cash bonuses to gain. If that was not enough, how about being in with the chance of winning a ski holiday to the French alps worth £3,000? This game is set to take place at Foxy on Friday 25th November and your cards will cost just 25p each to purchase. Pre-buy is available on the ski holiday game, so you log onto their site now and get your bingo tickets. If you was on Foxy Bingo last night you will probably be aware that their usual Monday prize bingo games did not play. Foxy have stated that this was due to a ‘bug in the systems’ so they basically had some technical issues going on which lots of sites do suffer with from time to time. Anyway, to make sure you do not miss out on the chance to win those fabulous cameras and camcorders they had up for grabs, prize bingo will be playing tonight instead. It will kick off at 8pm and tickets for these games start from just 1p. Let’s not forget either that there is £2,500 to be won in tonight’s guaranteed jackpot game at 9pm! Cards are only 25p for this one. This entry was posted in Bingo Blog and tagged Foxy Bingo on November 8, 2011 by Emma. Each week Foxy Bingo put on a fun slots tourney and this time it is all about that lucky number 7. Will it turn out to be fruitful for you? Well you really will have to play in it to find out. The lucky 7 slots / instant win tourney at Foxy Bingo will be running between now and Friday 21st October. Up for grabs is a cool £1,500 prize and you could win a share of it from simply playing the games you love, which is the beauty of the foxy tournaments. If you are a fan of slots this is a great instant win tourney to take part in and it will work like this. The 7 foxy players who have the biggest instant wins each day are guaranteed a cash prize each! Plus on top of this, the 7 players on Friday who have had the biggest cumulative wins during the week will take away the biggest cash prizes. Please note: The wins will be based on your total wins, minus wagers over a 24 hour period. There are all sorts of games you can choose to play for this comp at Foxy Bingo and they even include their progressive jackpot slots which come fully loaded with massive prizes of up to £50,000. Roland rat, Sugar train and frolokin frogs are three new slot style games on Foxy and you can try these out as well. There is a live leader board on their site in relation to this tourney, so you can see if you have won each day – as those winners names will be posted up. The guaranteed jackpot up for grabs on foxy tonight stands at £2,500 – This game will kick off at 9pm and your cards will cost 25p each to purchase. Now that could be an instant win you won’t forget. This entry was posted in Bingo Blog and tagged Foxy Bingo on October 18, 2011 by Emma.